AVI ADM9.1 review | What Hi-Fi? The AVI ADM9.1s have been around a couple of years, but this is our first listen to them. There's no denying the clarity of purpose or the obvious and immediate appeal of the concept. 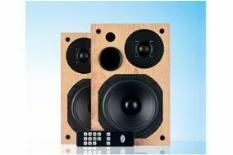 Each (beautifully finished) mains-powered speaker packs 75W of power for the 25mm silk-dome tweeter and a more-than respectable 250W for the 170mm bass driver. The left speaker also houses two digital optical inputs, stereo RCA inputs, a single RCA output to the right-hand speaker and a pre-out for a subwoofer. There's also a quality Wolfson DAC on board; the ADM9.1s need only a digital optical signal and they're ready to go. Playing Christy Moore's version of The Deportee's Club via either optical or RCA inputs (we found the AVIs' digital-to-analogue conversion bears comparison with that of our Cyrus CD6se CD player), the ADM9.1s deliver a clean, dynamic and authoritative sound, lean in the way distance runners tend to be lean but as fast as a sprinter. Detail is plentiful, integration between the drivers smooth, and low-frequency control absolute. The overall signature is upfront-going-on-insistent and the bass-hungry might be perturbed – hence the sub pre-out – but, where insight and articulacy are concerned, the ADM9.1s are resolute. Downsides are trifling by comparison. For pre-amp duties (input-selection, volume-control), there's no display or even LED telltale to show the remote is having any effect. Combined with a tardy volume input response and creaky handset, it makes using the 9.1s less of a pleasure than it should be. Once you've selected the correct input and appropriate volume, you won't care one bit.